Recorded September 12, 2016, this webinar presents an overview of the project, its findings and recommendations. Presenters include Don Duquette, JD, QIC-ChildRep Director, Robbin Pott, JD, MPP, QIC-ChildRep Assistant Director, Britany Orlebeke, MPP, QIC-ChildRep Evaluator, and Andy Zinn, Ph.D, MSW, QIC-ChildRep Evaluator. The National Association of Counsel for Children (NACC) provides an ABA-approved certification of lawyers as specialists in child welfare law. NACC Certification of the most experienced and capable lawyers for children has become an increasingly important means of professionalizing the field and identifying the emerging leadership and role models. For more information see NACC Certification. 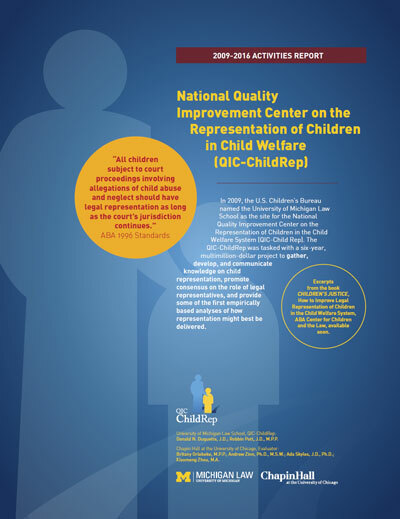 In October 2009, the U.S. Children’s Bureau named the University of Michigan Law School the National Quality Improvement Center on the Representation of Children in the Child Welfare System (QIC-ChildRep). This seven-year, multimillion dollar project aimed to gather, develop and communicate knowledge on child representation, promote consensus on the role of the child’s legal representative, and provide some of the first empirically-based analyses of how legal representation for the child might best be delivered. Chapin Hall at the University of Chicago served as the QIC-ChildRep Best Practice Model Training evaluator. The core of the QIC-ChildRep is our empirical research. The QIC ChildRep Best Practice Model forms the foundation of our Research and Demonstration Projects in Georgia and Washington State. The foundation and our reasoning underlying the "Six Core Skills" of the QIC Best Practice Model is reflected in the Needs Assessment that we conducted in our first year and in the Spring 2012 FLQ Article. The Flint MDT Study examines the nature and effectiveness of multidisciplinary teams representing children in child welfare. The QIC-ChildRep evaluations are the first-ever random assignment experimental research on legal representation in child welfare cases. For advocates, policy makers, academics, and students we gathered all the knowledge and information we could find about representing children in the child welfare system. This website includes a summary of State Laws governing child representation - we have all 50 states’ laws organized by common themes that address the common questions around child representation. This website also includes all the Academic Articles and Evaluations of Child Representation we could find. The entire website and all the resources are searchable. Please see QIC-ChildRep Products for a full listing of what resulted from our efforts. We hope the resources available here will assist the many of you who are working hard to improve the administration of justice for children. 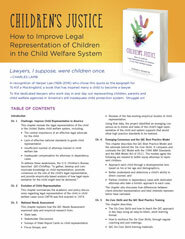 View Flyer for "Children's Justice"
CHILDREN'S JUSTICE is the final report of the QIC-ChildRep and is now available from ABA Publications. Click here. Find Six Core Skills Training Materials here.